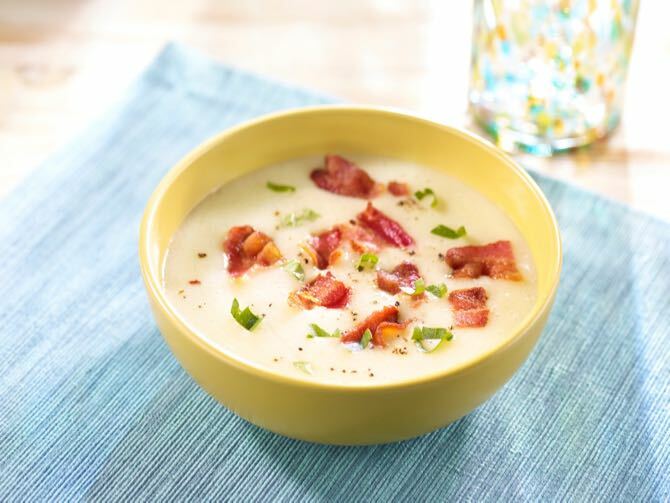 This super simple, rich and creamy soup will warm you during the colder months; the bacon adds great flavor and texture. Add some crusty bread and a simple green salad and you have a dinner everyone will love. In a soup pot over medium-low heat, cook the bacon until crisp. Remove the bacon using a slotted spoon and set aside, leaving the fat from the bacon in the pot. Add the diced onion and sauté over medium heat until tender and translucent, about 10 minutes. Add the potatoes, chicken broth, fresh thyme, bay leaf, salt and pepper and bring the soup to a boil. Reduce the heat to a simmer and cook for 20 minutes or until the potatoes are very tender. Remove the thyme sprigs and bay leaf from the pot. Using an immersion blender or carefully blending the soup in batches in the blender or food processor, puree the soup until smooth. Return the soup to the pot and add the half and half. Bring the soup back to a simmer, add hot sauce and adjust the seasoning. Serve hot, garnished with the crispy bacon.